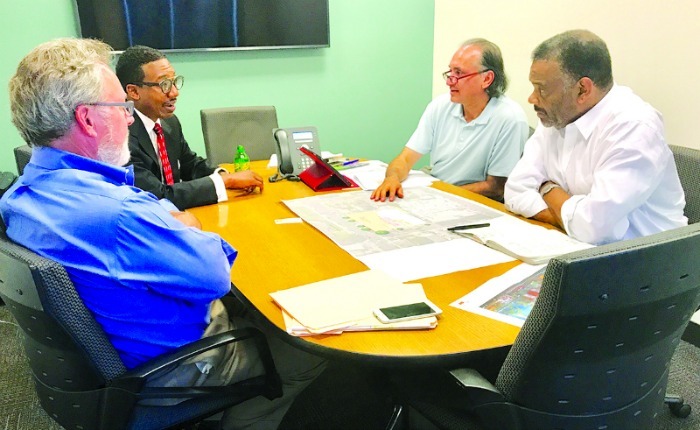 (l to r) Working on final funding application details is the Beacon Developers’ strategic advisor Paul Purcell, Dr. Kenneth Anderson, MWA Architects Principal Carlton Smith, and MWA senior designer Sanjeev Malhotra . After months of planning, community outreach, and detailed consultations with developers, architects, and elected officials, the Rev. Dr. Kenneth Anderson of Williams Chapel Baptist Church is submitting an application to the City of Oakland for funding of 70 units of affordable housing for low-income seniors. Dr. Anderson is applying for funding support from the Measure KK funding that was approved by voters in last year’s election. The application’s deadline is Sept. 15. He says the church’s application is the result of hard work emanating from the congregation’s long-held vision that started in August 2015. “We have come this far by faith and our hard work of hosting community forums and seminars,” said Anderson. City, county and community leaders also recognized the positive impact of the final rally for the passage of Measure A1 held at Williams Chapel. The Post Newspaper has contacted several churches since Measure KK passed and thus far Williams Chapel is the only faith-based applicant seeking funding for poor and low-income seniors. Recognizing that his church’s proposal marks the first time in many years that a faith-based developer is seeking a large sum of money to be committed for housing for the poor, Dr. Anderson said he and his development are prepared to make any adjustments required by the city and county. In Nov. 2016, both Oakland and Alameda County passed bond measures that could fund this housing project. Dr. Anderson hopes that the Williams Chapel application will be approved first by the city with Measure KK funding, then by Alameda County with Measure A1 funding. The intent of both ballot measures is to provide affordable local senior housing, and prevent displacement of vulnerable populations, along with other infrastructure goals.